A fed-up Frances McDormand battles it out with Woody Harrelson and Sam Rockwell in this crime drama. (SPOT.ph) The 1976 film Network made popular a quote said by Peter Finch's fed-up TV news anchor that goes, “I'm as mad as hell, and I'm not going to take this anymore!” That quote embodies Martin McDonagh's latest film perfectly—this is a film about a woman so angry and so frustrated, she's going to call you out for it, even if it makes her look insane and everyone she knows turns on her. There is power in this film, as it follows its lead in her quest to solve her daughter's murder, and that makes for an increasingly compelling story, despite the film's questionable choices on handling race. Unsurprisingly, Chief Willoughby (Woody Harrelson) and the rest of the police station, which includes the racist, corrupt, and altogether awful officer Jason Dixon (Sam Rockwell) are not happy about the town's new landmarks. Willoughby is disappointed as he has tried hard to find the killer and is sympathetic to Mildred's cause, but Dixon is incensed and attacks the man who rented her the billboards, aside from arresting Mildred's African-American friend on a questionable charge about drug possession. Things get more intense in the town and clashes continue, with Mildred not letting her foot off the gas and Dixon throwing more fuel into the fire. McDonagh has made a name for himself writing and directing dark comedies for both stage and screen, the most well-known being Seven Psychopaths and the Oscar-nominated In Bruges. Three Billboards is an attempt to step away from the black humor, and approach something more grounded, more real, with more dramatic emotion. It's a welcome change, as his previous films have made audiences laugh at death, while this latest one confronts the viewers with horrible realities. Is McDonagh overly effective at it? Not perfectly, no. It can be felt at times that the film is trying to keep the dramatic seams together but McDonagh can't help himself to make light or make a joke out of situations he's prepped as something not to make fun of, that it almost makes one wish the film just went full black comedy. The tone can be confusing but what's great about McDonagh's writing here is when he writes for his actors—fiery dialogue, masterful use of words, and while maybe these Midwestern folks wouldn't really talk this way, it works for the film's world. 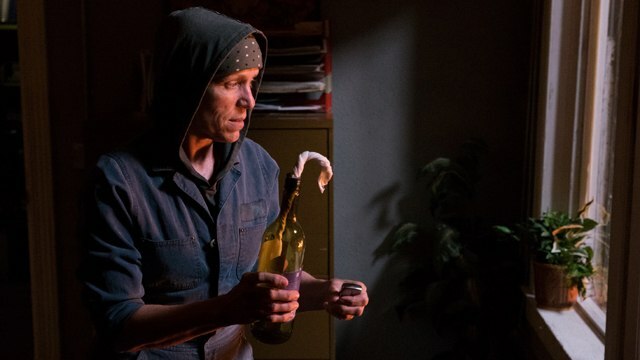 Either Frances McDormand was born to play Mildred, or Mildred was born to be played by Frances McDormand, because there really is no actor who fits this lead character more perfectly. McDormand does what she does best, and you really can't fault her for that. 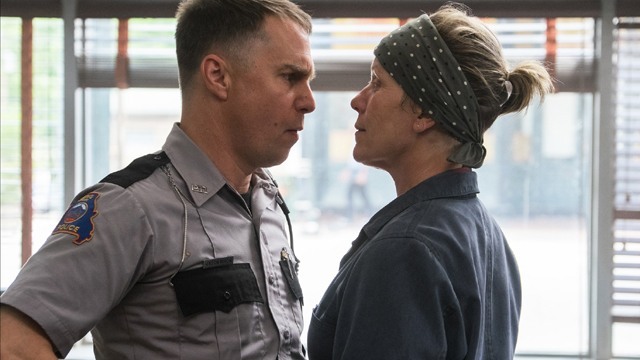 It might be just a mixture of things we've seen McDormand do in Coen Brothers films, but she is feisty, powerful, explosive, and perfect as a grieving, frustrated, and irate mother who will stop at nothing to get the justice her daughter deserves. McDormand isn't the only one that gives a stunning performance. Sam Rockwell is terrific as the bumbling, destructive, awful cop Dixon, and Woody Harrelson is very touching and empathetic in a much quieter and subtler role than one would usually see Harrelson in. 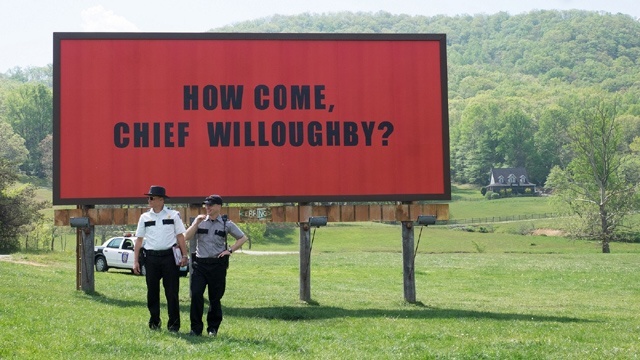 A scene that takes place just after Mildred puts up the billboards between McDormand and Harrelson is the film at its most pure and emotional, as they talk about the police investigation and Mildred's use of the billboards. Wonderfully written and acted, it's the best scene in the film—that quiet moment in a film full of loud noise. Other supporting actors, like young Lucas Hedges and Game of Thrones' Peter Dinklage, also have great moments to shine, but not enough material to really make an impact. 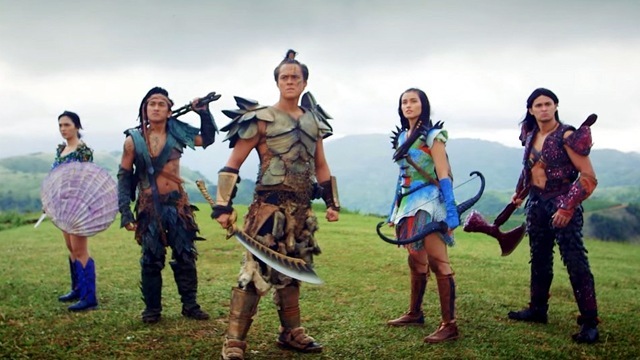 The film does have issues in its last act, as it works on redemption and resolution. While it tries for a more crowd-pleasing but still-mysterious end, all the time spent on solving the conflict doesn't make the end feel as justified as it should be. While there are moments of fist-pumping empowerment, it doesn't feel like the film is as satisfying as it intends to be. Even so, there's something inspiring in a tale about a woman so angry and so fed-up, she's calling you out on it. In the current moment of our world, with the #MeToo movement and the fight for equality, this film shows that women should be angry and should speak out against unfairness: Be mad as hell and don't take injustice anymore. Three Billboards Outside Ebbing, Missouri opens in selected cinemas on February 14. Cinemas include Eastwood, Shangri-La Plaza. Century City, Commerce Mall, Festival Mall, Fisher Mall, and Gateway.